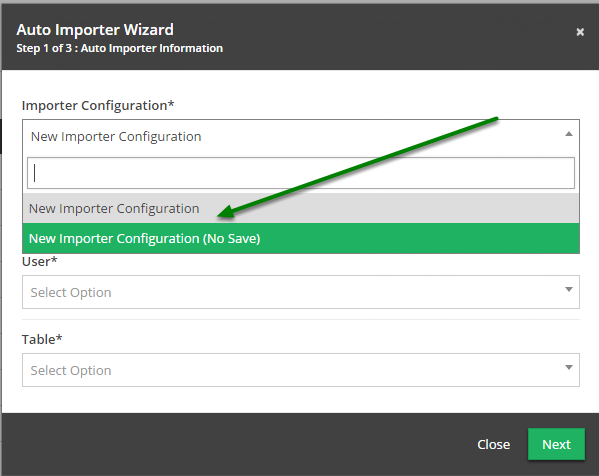 Documentation and SupportReleases Wasabi Release Notes 2016-01-20Auto Importer Wizard now allows configuration without saving. You can now configure Auto Importer Wizard and generate file names without saving. 1. Open 'Auto Importer Wizard' from the 'System' menu. Click the 'System' menu icon. Click 'Auto Importer Wizard' from the 'System' menu to open the 'Auto Importer Wizard' modal. 2. Select 'New Importer Configuration (No Save)' from the 'Importer Configuration' drop down. 3. Configure wizard to generate file names. Configuration is the same as before, only with this option the configuration is not saved. Prev: Users can now search for tables by table ID. 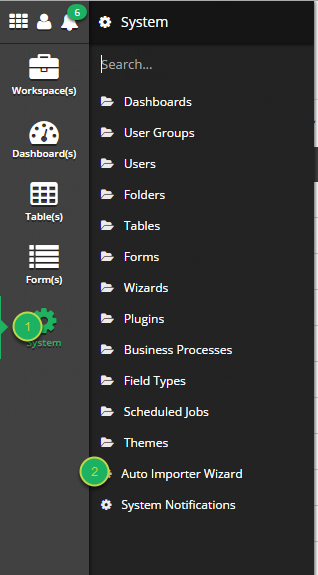 Next: Business Processes triggers can now be set.